When: Thursday, October 26, 2017 | 12:00 p.m. – 1:00 p.m. 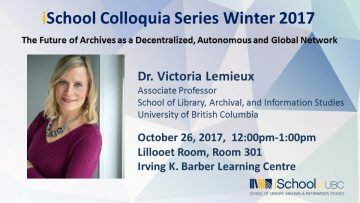 The School of Library, Archival and Information Studies, the iSchool at University of British Columbia, is pleased to welcome Dr. Victoria Lemieux, Associate Professor, School of Library, Archival, and Information Studies, University of British Columbia, as a speaker in our Winter 2017 Colloquium program, on the topic of “The Future of Archives as a Decentralized, Autonomous and Global Network”. Registration is not necessary and the talk is open to all interested members of the community. Light refreshments will be served. Networks are now everywhere. We are surrounded by them, even enmeshed in them. Networks are decentralized – or at least leave the impression of being so; unlike hierarchies, there is no command and control from the top. They also often operate autonomously, with many parts interacting seemingly without human intervention. And, they often transcend the national or the particular, while at the same time encompassing it. They are – or seek to be – globally interconnected. Blockchain technology offers examples of decentralized, autonomous and global networks in operation. In this talk, Victoria Lemieux will discuss how blockchain technology is already transforming the creation and management of current records, how it may transform the nature of archives in the next 30 to 40 years, and what this may mean for archival practice and education. Dr. Victoria Lemieux is an Associate Professor of Archival Science and Sauder School of Business Distinguished Research Scholar at the University of British Columbia. Her current research is focused on risk to the availability of trustworthy records, in particular in blockchain systems, and how these risks impact upon transparency, financial stability, public accountability and human rights. She holds a doctorate from University College London (Archival Studies, 2002), and, since 2005, has been a Certified Information Systems Security Professional (CISSP). She is also the winner of the 2015 Emmett Leahy Award for outstanding contributions to the field of records management, a 2015 World Bank Big Data Innovation Award, and a 2016 Emerald Literati Outstanding Paper Award.